Cuban cop Mercado has a score to settle, on behalf of a deadbeat dad, a ‘traitor’ who skipped free from Castro’s control to set up a new life working illegally in Colorado. He settled in a ski resort popular with the Hollywood set, where the facade is maintained by the immigrant cleaners and labourers who work for below minimum wage while the local sheriff is bribed to turn a blind eye. Hernandez Sr’s dreams of fortune and freedom came to a swift end when he was killed in a hit-and-run accident. Sworn to avenge his death, Mercado has some obstacles to overcome – not least getting out of Cuba, where visas are as elusive as constant electricity. 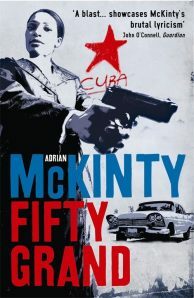 Switching back and forth between heat-soaked Havana and the icy luxury of the mountainside resort, Fifty Grand is an audacious thriller from an acknowledged talent – and an incendiary debut for a new hero.